The North Campus central open lawn area serves as the outdoor civic space for the North Campus community and visitors. 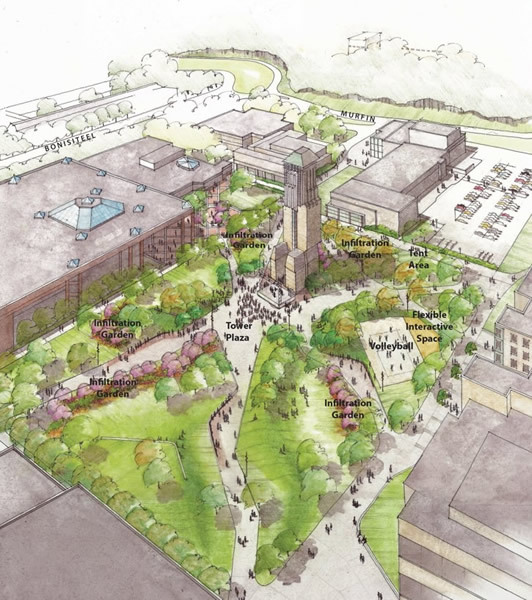 Covering approximately four acres, the Eda U. Gerstacker Grove project will greatly improve the quality of this outdoor space, creating more vitality and activity within the North Campus core, and providing more opportunities for interaction. Some of the new program improvements include creating a new central plaza that can serve as an informal amphitheater, new walkways, integrated seating throughout, additional trees, improved lighting, and electric and water infrastructure to support outdoor activities, events, and displays.